The same technologies used in driverless cars are set to transform the shipping industry. The world may be focused on self-driving cars, but the autonomous revolution won’t be limited to roads and highways. The oceans will soon be filled with driverless ships — sleek new vessels that promise big safety and economic advantages over conventional piloted ships. "The idea is to do things more efficiently and transport more with less people onboard," says Oskar Levander, a vice-president in the marine division of Rolls-Royce. The U.K.-based company, a leader in the development of autonomous shipping technology, envisions a future in which everything from naval vessels to ferries and tugboats to cargo ships will have some degree of intelligence. Such smart vessels will be able to, for example, autonomously sail from London to New York City, coping with storms and avoiding collisions without human intervention. As a result, shipping companies may replace their giant cargo vessels with fleets of smaller, more fuel-efficient boats. Command centers to monitor these ships will pop up at select ports around the world. The shipping workforce will change along with the vessels. Crews will be largely unnecessary except on cruise ships, where staff are needed to serve passengers. 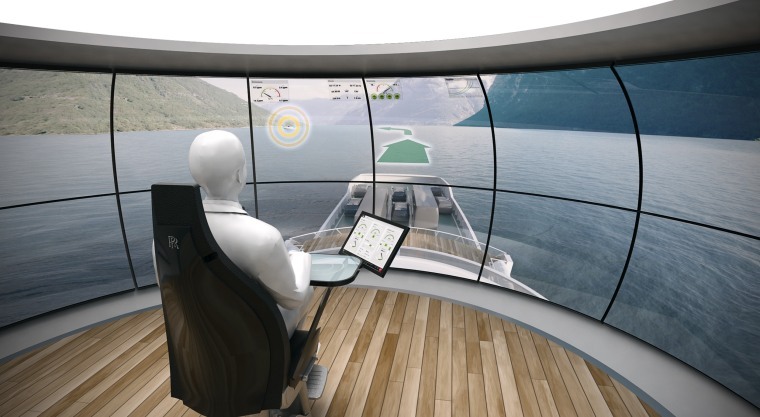 Captains will still have a job to do — but they’ll be monitoring multiple autonomous ships from shore rather than commanding a single ship at sea. "The roles are changing, but we will be providing an opportunity to be a seafarer with better working conditions and safer environments," Levander says. That concern for safety is a primary driver for autonomous ships. Levander points to a 2012 report showing that human error, particularly fatigue, is behind 75 to 96 percent of marine accidents. Human error is less of a problem in commercial aviation because of autopilot and other automated systems, says Phil Bourque, director of business development for Sea Machines Robotics, a Boston-based startup that is developing technologies to retrofit conventional ships with autonomous capabilities. "There are all these systems in place to make sure the human error is removed — but on boats, it's not." In addition to saving lives, autonomous ships will cut costs. Levander estimates that a fully autonomous ship might cost 20 percent less to operate than a conventional crewed ship. Without the need for crew quarters, a conventional bridge, lifeboats, and other familiar features, ships can be lighter and more compact and thus less expensive to operate — although they may be more expensive to build. It costs nearly $100,000 to retrofit an existing vessel with Sea Machines gear. And the all-electric Yara Birkeland — a 100-container vessel being built in Norway that is slated to launch with a crew in 2018 and operate autonomously by 2020 — has a price tag estimated at $25 million. That's about three times as much as standard container ships of similar size. Rolls-Royce is focused on developing autonomous systems that can work at sea for weeks at a time without human intervention, Levander says, adding that the required sensor, navigation, and communication technologies already exist. Autonomous ships will "see" the world and potential obstacles through a combination of visible-light and infrared cameras, radar, and LiDAR (light detection and ranging), which works like sonar but uses light pulses instead of sound. The information is fed to the ship's onboard computers, which factor in satellite navigation (GPS) and weather reports as well as other ships’ location and identity broadcasts. Bourque says the next iteration of Sea Machines systems will have dedicated short-range communications (DSRC) technology, which is now being implemented in the automobile industry. That will allow ships to communicate by transmitting their location, direction, and speed directly to one another over a dedicated frequency band. With all that data helping to steer and operate the ships, captains on shore will simply enter the destinations for the vessels under their control and then monitor their ships’ progress. If they need to assume direct control of a ship — to do a particularly complicated docking maneuver, for example — they can do so. Bourque and Levander think the first unmanned ships could hit the seas as early as next year. By 2025, the vessels will become more mainstream and the big, ocean-going vessels will arrive on the scene. Five years later, autonomous vessels will be commonplace. "It will all happen in steps, but we don't believe taking people [out of the picture] is necessarily a good thing," Bourque says. "We're going to see systems take on more responsibilities but the human will still be there for added safety, just like with airplanes."